According to the “2015 OLED Display Annual Report” published by UBI Research, it was researched that the 5-inch AMOLED display is the main product for a smartphone. The report shows almost no fluctuation in the number of AMOLED equipped smartphone manufacturers for the last three years from 2012 to 2014 – 13 (2012), 11 (2013) and 14 (2014) – but the major smartphone display size that these companies sold was set in-between 4-inch and 5-inch. Among 31 AMOLED equipped products, there was only one 5-inch smartphone accounting for 3 percent in 2012, but it has increased to 21 percent with 5 products among 21 in 2013, and 19 products in total of 27 forming 70 percent in 2014. Samsung Electronics strategized the two elements which are not available in iPhone as points of differentiation to compete with the biggest smartphone rival company Apple. The first plan is targeting the color gamut of LCD. The existing LCD can only reproduce approximately 80% of NTSC which is the broadcasting standard. Although it became possible to enjoy TV and movies through a smartphone with the development of communication technologies, there is a difficulty in reproducing the 500nit of TV quality on a smartphone with the brightness of 200nit. The limit in increasing the brightness of a smartphone is in that the power consumption needs to be minimized to use the smartphone for a long time with the battery. In view of that, Samsung Electronics chose the AMOLED panel as a key strategic part meeting the NTSC standard in low power consumption as an alternative for the LCD panel for the consumers to identify more precise colors. It is expected that the demand for AMOLED panel capable of accurately realizing colors of a product will increase further given the latest growth in shopping clothes with smartphones. The second plan is in the display size. While iPhone focused on a 3-inch small sized smartphone for a better sense of grip to enhance portability, Samsung Electronics was more focused on “a product of better visibility” rather than “a product of better hand grip”. Obviously the early AMOLED panel has low resolution. Therefore, the bigger display was needed to realize high-resolution as it is hard to fix the opening ratio of shadow mask which is used in manufacturing the pixel for AMOLED panel. Samsung Electronics succeeded in catching up with Apple, the inventer of smartphone, in terms of the color gamut and size of AMOLED display. Now Apple finally abandoned the matter of grip and expanded the display size to 5-inch. Although Samsung Electronics was a latecomer compared to Apple in the smartphone market, the choice of AMOLED by Samsung Electronics made the Samsung Electronics of today and also prepared the base for the AMOLED to thrive. In addition, the Samsung Electronics’ strategy enabled the smartphone display in the world to develop into a 5-inch “device to see”. Began from a CRT, also called brown-tube, the TV market went through a LCD TV, a PDP, and a LED and finally reached at an OLED TV. The TV market with the history of almost 80 years now narrowed down to the war between a LCD TV and an OLED TV. Theoretically speaking, it is genetically difficult for both a LCD TV and an OLED TV to become a better TV than a brown-tube as LCD realizes gray scale by adjusting the level of voltage from the liquid crystal which cannot completely block all light while the organic materials in OLED decompose when exposed to ultraviolet light not to mention the blue light. Not deterred by these limitations, the LCD pushed out the rival displays of the brown-tube and PDP in the market, obtaining the honorable crown, and now it went on to prepare for the competition with a new display of OLED in full scale. The picture quality of a display is determined by the three elements of contrast ratio, color gamut and resolution. The contrast ratio is the most basic information necessary for recognizing an object developed as a human evolves for millions of years. The human eye can distinguish an object only with a black and white shape at night without the moon and it also perceives a three dimensional space as a distant object is the information resulting from the difference between contrast ratios. But the human eye gets tired faster than any other organs. When a human gets tired, he/she closes his/her eyes to sleep and this action is to block the light from outside. For the bright lights like sunbeam blind the human eye that is susceptible to light, it is critical to avoid the exposure to direct lights around the eyes by wearing a hat with a brim in the open air. The sunglass functions in the same purpose. Thought an office area uses bright florescent lights as a human gets active in a bright place, a house requiring comfort, high-end restaurant, hotel, etc. are recommended to take the brightness creating the appropriate shadows according to the position of the right sources. It is because a human body relaxes and feels comfortable through the eyes in the adequately dark environment. Furthermore, the human eye cannot detect the intensity of very bright light but the degree of darkness can be distinguished easily. Therefore, a TV that is most beneficial to a human body is a product made with the display that fully produces darkness. That is the OLED TV. LCD always employed the notion of resolution as distinctive marketing strategy when competing with a brown-tube and a PDP in the market. It is due to the fact that the display with the higher resolution provides more information and the picture and video express smooth images. Though LCD had poor contrast ratio and color gamut than a brown-tube and the price also was relatively high, it grew rapidly indebted to the diverse contents like MS Office and the development of internet. The emergence of OLED which has superior contrast ratio and color gamut than LCD and even the resolution equivalent to LCD became the biggest challenge for the LCD panel manufactures which have already made a huge investment. As LG Display is the only manufacturer capable of producing a large OLED panel with the 4K resolution, it is very urgent for the TV manufactures to secure the highest possible quality LCD TV to compete with the LG Electronics’ OLED TV. The LCD TV made with the BLU using the quantum dot (QD) material got one step closer to the OLED TV obtaining the 100% of NTSC which was only available for OLED. The key is the contrast ratio. Along with LG Electronics, Panasonic and Skyworth joined the UHD TV industry as releasing the 55-inch, 65-inch and 77-inch UHD OLED TVs at CES2015. In response to this, the LCD TV manufacturers unveiled numerous new LCD TVs at CES2015 combining different technologies of QD, HDR, and curved design. OLED is catching up with LCD in terms of resolution and LCD began to compete with OLED in respect of curvature and color. There were competitions with regard to resolution between OLED and LCD in the history of smartphones. As the resolution of small and medium LCD improves in order to distinguish itself from OLED starting from 200ppi in 2010 to over 500ppi through the Retina (326ppi), OLED accomplished the equivalent resolution through the FMM mask and pentile technologies. The LCD TV industries are anticipated to develop products with ultrahigh resolution in consideration of the small and medium OLED. And the OLED TV industries are reviewing the technologies to answer to this trend of ultrahigh resolution. The resolution over 8K is available for OLED TV by either converting the bottom emission structure which is currently applied to the existing 4K OLED TV to the top emission structure with higher aperture ratio or producing the RGB OLED panel with the solution process. Sony already developed and introduced the world’s first 4K OLED TV with the top emission technology at CES2013. Employed for Samsung Electronics’ Galaxy series, the top emission structure can be applied to a large area but the complication is in the transparent encapsulation. It is hard to use the frit technology currently used in small and medium to a large OLED for its durability issue. The hybrid encapsulation method using the transparent encapsulation film emerges as the optimum alternative and the developments are set in that direction. 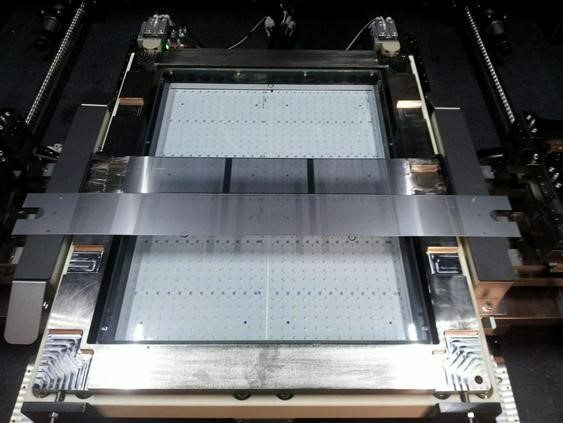 The substantial market growth is expected as the transparent hybrid encapsulation technology is critical in realizing a large area flexible OLED and transparent OLED besides the ultrahigh resolution using the top emission. G Watch R and Galaxy Gear S by LG Electronics and Samsung Electronics respectively were disassembled to see their structures. First of all, much of the internal and external design concepts were quite similar. Claiming to be the classical sports type watch, the G Watch R is a smart watch emphasizing the sense of watch rather than its diverse smart functions while Galaxy Gear S was produced with a design of fashion watch. From dismantling both products, it was revealed that for G Watch R, the plastic OLED display which corresponds to the plate of watch is attached to the glass of the watch as shown by removing the back plate by unscrewing from the back side just like a regular watch and internal components, but for Galaxy Gear S, the flexible OLED panel was attached to the front side with adhesive so that the window detaches as applying heat to the front side. In terms of the module design aspect including display, G Watch R shows dualised touch whereas Galaxy Gear S shows neatly unified look as FPCB. As the flexible OLED that Samsung Display is producing uses the touch screen of on-cell method, there is only one FPCB but for the plastic OLED of LG Display, it has the touch of add-on method, expected to have two FPCB to give signals. The radiation design is critical in the smart watch as a variety of components are concentrated in it. In case of G Watch R, the sections for the plastic OLED and electronic components are divide with a radiation sheet in between. For Galaxy Gear S, there is a small radiation sheet in the plastic component which separates the metal Foil assumed to be the Cu film to reduce heat generated from the display in the back side of display (refer to the image above) and component. Overall, the conclusion drawn from disassembling both products analyzed that G Watch R took the design of classical watch not only for the look but also the internal structures while Galaxy Gear S, the strong one in the smart phone market, seems to be a fashionable device inheriting the genes of a smart phone. The DVCE (Display Valley Conference & Exhibition), supported by Samsung Display is held in every November in Asan, Chungcheongnam-do as one of the major events in the region which has established its position as a mecca of display industry. It is an international conference created by the active support from Samsung Display for the purpose of local development and industrial development of display business and it is the 10th year of DVCE in 2014. In the first day of DVCE on the 11th, Hak-sun Kim, the vice president of Samsung Display gave a key note speech titled “Display Beyond Imagination”, suggesting the future directions for display through humanistic considerations. Given that most of display related conferences or seminars are primarily of hardware or technology associated contents, this was the first occasion that the directions for the future display was proposed. Comparing the display with the history of art, Kim defined a new technology market to converge analog and digital. He mentioned the necessity to produce creative display by employing new functions in display as famous art masters have created innovative artworks by developing various techniques. In particular, he has emphasized that it is critical to produce a human-friendly product as a human interface through fundamental understanding and reflection on the light and human eyes when developing a display. Kim proposed a vision for the future of the convergence product equipped with varied functions like lighting and eye, bio sensor, haptic sensor, etc. through the techniques employed by the artists like lighting and perspective, trompe I’oeil, texture, etc. Kim expressed sincere regret for the decrease of display industry in Korea where new products are no longer produced, claiming the need for engineers who develop displays to converge and combine by means of humanistic consideration in order to promote display industry. The Chinese display companies like Visionox, Tianma, etc. 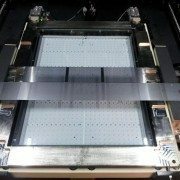 are preparing the development and commercialization of OLED panel with BOE at the head. To keep up with the present leading company, Samsung Display, these second movers must be equipped with both product quality and reasonable price. As the front runners of OLED panel, Samsung Display is maintaining the exclusive market for rigid type OLED which is made of a glass, and LG Display is producing the plastic (flexible) OLED panel using PI substrate for mobile devices. The OLED panel is produced in QD resolution as a mobile device changes to adopt a high-resolution, but it is not a real resolution but uses a pentile method. For Samsung Display and LG Display are the two leading companies of the OLED industry, the supply chain is very firmly structured. So the relatively latecomers in this industry have difficulties in getting good materials and components from the suppliers who have intimate relationship with these two companies from the materials to equipment and components providers. Furthermore, the established companies are managing and controlling the ecology of the industries to exclude the rival companies, preventing suppliers from providing products to the competing companies or late starters. Due to these strategies, the new comers are unable to secure sufficient resources for the development. A typical component is a shadow mask which is critical for high-resolution. Known as a fine metal mask, this mask is an essential element to produce a high-resolution OLED of RGB structure and the shadow mask made of about a 40um thin plate to produce the high-resolution OLED which is more than 300 ppi but it is hard to find suppliers for the late comers. BOE is seriously reviewing the matter of developing the OLED of WRGB structure to solve the shadow mask issue. The WRGB OLED does not require a fine metal mask as it uses the emitting materials in layers. The WRGB OLED creates the white light and realizes colors through the color filter. Tianma is in the process of developing the slot type mask splitting the shadow mask.